When I first heard on Sunday afternoon that a small private plane had crashed into a house in Kent, killing all on board, I couldn't help fearing that someone from the motor racing world might have been involved. After the deaths of Colin McRae, Steve Hislop and Bertie Fisher, it somehow seemed a distinct possibility. And so on Monday, looking up BBC News, it turned out to be the case. Sportscar team boss Richard Lloyd and Scottish racing driver David Leslie were amongst the five victims of the accident. Sympathy, obviously, goes out to the family and friends of all five men on board the plane. It was Leslie whose name meant the most to me personally, as a racing fan. I first remember seeing David Leslie race as a kid attending the Donington 500km sports car race, back in 1989. Sportscar racing was a rather bigger deal back then than it is now, with works teams from Jaguar, Mercedes, Porsche, Nissan and Toyota vying for honours. New to the field for 1989 were the works Aston Martins being run as a joint venture with the Ecurie Ecosse team. The Aston Martin AMR1 was never amongst the quickest C1 cars in its brief sports car racing career, but it looked absolutely fantastic in its clean white blue and red livery. In Leslie's hands, it picked up a 6th place at Donington too. A few weeks earlier, he had gone even better at Brands Hatch, finishing 4th paired with Brian Redman, despite the fact that the late 60s F1 star was by then well past his competitive best. From there, he took the well trod road into Sportscars. Scottish Businessman Hugh McCaig had taken it upon himself to revive the Ecurie Ecosse sportscar name of the 1950s and became one of the leading lights in the new Group C2 sportscar category during the mid-1980s. David Leslie, as a solid, promising and perhaps importantly, Scottish driver, was recruited to the driving strength. Their successes included winning the teams' title in 1986 and a second place in class in the 1987 Le Mans 24hr race. The team withdrew from C2 in 1988 in order to concentrate on their Aston Martin C1 project. That, however, was killed almost before it had begun, when the parent company ran into trouble and was bought by Ford. The American car giant already owned Jaguar, and could see little point in paying two of its luxury car brands to compete against each other in sports car racing. Leslie would go on to drive for Jaguar at Le Mans in 1990 and 1991, but did not finish the event on either occasion. It was his, and McCaig's move into touring car racing in 1992 and 1993 with the Ecurie Ecosse Vauxhall Cavaliers which brought him to wider attention though. McCaig always had a knack for ensuring that his cars were stunningly well turned out, and the Saltire coloured Vauxhalls were no exception. More importantly, though, the Ecurie Ecosse Cavaliers were quick. Quick enough to embarrass the works team on occasion, and quick enough to allow Leslie to win the end of season TOCA-Shoot Out race at Donington in 1993 (a race perhaps best remembered for Nigel Mansell's messy appearance in a Ford Mondeo). At an age when most racing drivers' careers were beginning to wind down, Leslie finally got himself into a car which would enable him to take outright wins. From there, Leslie established himself as a significant force in British touring cars, driving for Vauxhall, Mazda, Nissan and Proton, taking 9 wins and scoring a best championship position of 2nd in 1999, behind Laurent Aiello at Nissan. He finally bowed out of the series at the end of 2003 after a fruitless couple of years with the Proton Impian. After the end of his touring car career, he took up commentary for Eurosport, working alongside Martin Haven on their coverage of the World Touring Car Championship and the FIA GT series. A quiet, softly spoken man who might not initially seem an obvious candidate for the job of sports commentator. He came across more as a college lecturer than a media pundit (and technically, he was, as he lectured part time in Motorsports Management at Swansea). However, his depth of knowledge and enthusiasm for the sport was nonetheless obvious from the start, and was complemented with an endearingly dry sense of humour. On at least one occasion, he dovetailed commentary duties for the FIA GT series with driving duties for Graham Nash Motorsport's Saleen S7R. "Sorry, got to go now, I'm driving in a few minutes..." Not something I've often heard from a commentator. I only once met David Leslie, very briefly, at the Knockhill Speedfair in 2006. He was there running demonstration laps in his old Ecurie Ecosse (which he pushed notably closer to the limit than Jackie Stewart did his old championship winning Tyrrell. He came across, though, as a pleasant, approachable man, and to judge by comments made after his death by those from the racing world who knew him, the impression I was given was accurate. Leslie also took the opportunity that day to race his recently restored 1977 title-winning Formula Ford Royale RP24. It says something about the man's genuine enthusiasm for the sport that he not only went to the trouble of restoring his old car, but raced it with considerable aplomb. Against opposition in much more modern machinery, and despite being slow in a straight line, he stood every chance of winning the race, before his engine gave up the ghost. How many other semi-retired racing drivers in their 50s would go back to their Formula Ford roots in this way? He was a man, who it seemed, simply loved racing. Neil, at Fastest Lap, tells his own story of his exploits in a Shelby Mustang at Laguna Seca back in 1997. 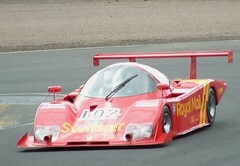 David Leslie in action in his restored Royale RP24 at Knockhill in 2006. For some people, motorsport is about glamour, fame, 'chasing the dream', making piles of money or being in with the 'in crowd'. It's this mentality which drives ITV's interminable, tedious pre-race features. David Leslie, it seemed to me, was the very antithesis of this kind of attitude. A man for whom it was all about the racing, who in the words of Allan McNish "gave far more to motorsport than it ever gave back to him." Great post. I was at that Donington race in '89 too and was very impressed with the Aston AMR1 and its drivers. Leslie will be very much missed. I remember watching David Leslie race at Ingliston from 1980/81. He had by that time won his FFord championships but had never found the budget to step up so he was racing in the Scottish Formula Atlantic Championship. A complete waste of talent but an absolute joy to watch a driver of that calibre handle that type of car on a circuit as tights as Ingliston. I think he probably won every race he entered over a two or three year period. He also raced the same car in Formule Libre against all sorts of cars including some DFV engined mid 70s F1 cars. He regularly beat them too. There were people (hundreds) who used to turn up just to watch him drive. When his race finished and he had completed his lap of honour you could see groups of people heading to the gates even when there were two or three races still to go. When he finally got an F3 deal in the awful Magnum he showed his ability but it was futile against the hordes of Ralts and as soon as they sorted out their set ups he had no chance. His talent and ability deserved much better but he was one of those drivers who never failed to get the best out of his car but couldn't generate a budget. I never met him beyond the occasional hello in the paddock at Ingliston or Knockhill but despite the fact that he should have been racing at a far higher level he had no chip on his shoulder about it and was always very pleasant to everyone. I never heard anyone say a bad word about him and that was certinly not the case about leading lights in other classes. Along with his father he helped a lot of young Scottish drivers and I can see no-one else who is likely to take that role on. Formula 1 2008: Raikkonen for the double?